Four members of our team participated at one of the most prestigious international forum of Roman archaeologists, organized annually in Hungary. The VIII. 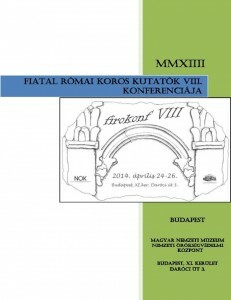 Fiatal Római Korosok Konferenciája (The 8th Conference of the Young Roman Archaeologists), organized by the Centre for National Cultural Heritage of the Hungarian National Museum, held this year in Budapest, between the 24th and the 26th of April, hosted many interesting papers dealing with a variety of subjects on Roman culture, history, archeology. Our team held two presentations: one focused on problems related to the location of the auxiliary units in the forts from Mureș County and their connection with the stamped ceramic building material, while the other presented the old and the recent data concerning the Roman fort from Brâncovenești, stressing on its complexity.